1. Junior forward and assistant captain Bobo Carpenter takes the top spot with 30 points. T2. Despite missing four games this season for the Olympics, junior forward and assistant captain Jordan Greenway finished tied for second with 27 points. Freshman forward Shane Bowers also picked up 27 points. Bowers finished second in the Hockey East among freshmen. T3. We have a tie between sophomore defenseman Dante Fabbro and freshman forward Brady Tkachuk. Both had 26 points in the regular season. Fabbro finished second in Hockey East among defensmen. Tkachuk finished third among freshmen. 1. Carpenter once again takes the top spot here, finding the back of the net 18 times. 2. Bowers finds himself with 16 goals this season. Bowers finished third in the country among freshmen. 3. Greenway lit the lamp 10 times this season. 4. 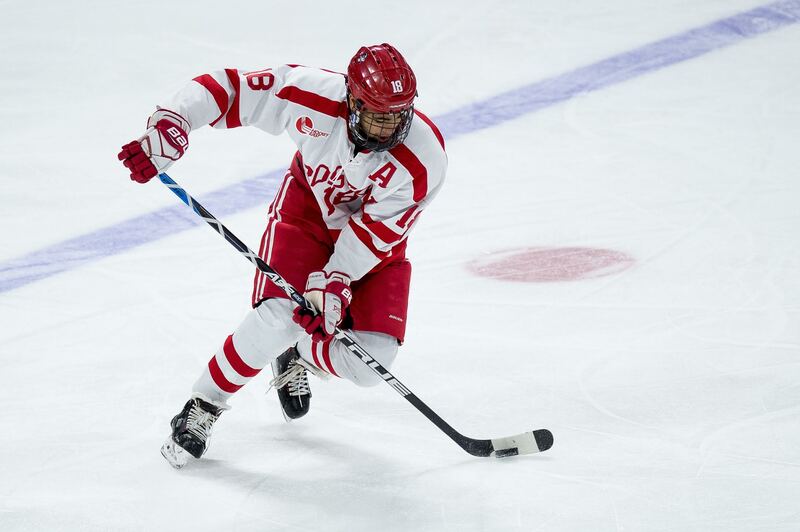 With nine goals, Fabbro finished tied for fourth in the country among blue liners and at the top of the conference. *6. Despite not scoring a goal until the fourteenth goal of the season, Tkachuk finished the season with seven goals. He finished tied for tenth among freshmen nationally. T2. Greenway finished the season second on the team tied with Fabbro with 17 assists. Fabbro finished tied for fourth in the conference among defensemen. 4. Sophomore defenseman Chad Krys finished fourth on the Terriers with 16 assists. Which had him sixth in the conference among blue liners. *6. Carpenter finished his strong junior season with 12 assists. 1. Carpenter finished fifth in the conference with seven power play goals. T2. Fabbro led all Terrier defensemen with four goals on the power play, Harper also finished with four goals on the power play. T3. Greenway, Krys and Bowers all found the back of the net three times this season with the man advantage. T2. Greenway and Tkachuk had a short handed goal this season. 2. Fabbro had one of two hat-tricks from the blue line in the conference. 1. Freshmen led the way with 109 points this season. They combined for 40 goals and 69 assists. 2. Sophomores combined for 81 points with 26 goals and 55 assists. 3. Despite having three players, the junior class of Carpenter, forward Ryan Cloonan and Greenway combined for 58 points with 28 goals and 30 assists. 4. In their final season at BU, the seniors had 38 points off 11 goals and 27 assists. Their power play also finished second converting on 22.6 percent of its chances. It also finished ninth in the nation with its power play. 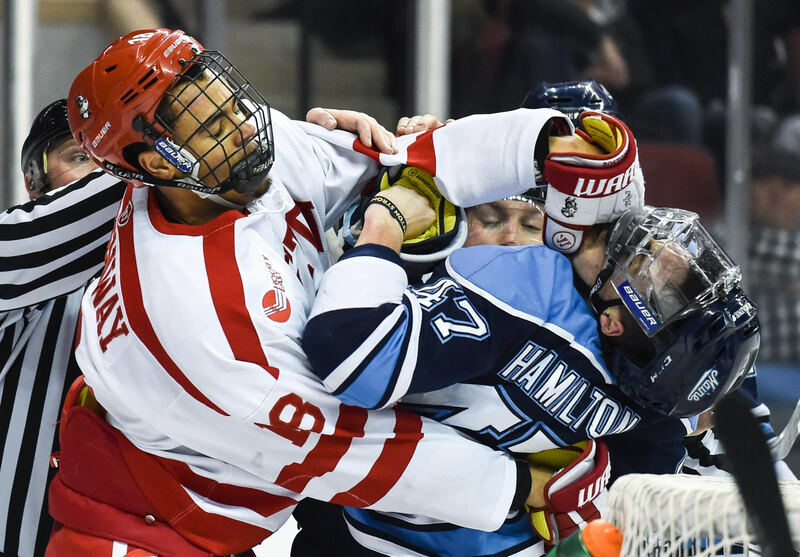 Last weekend, the Boston University men’s hockey team swept Merrimack College in its first sweep of the season. This weekend, the Terriers continued their momentum as they traveled to Arizona and swept Arizona State University. Friday night, the Terriers and the Sun Devils played each other in the first ever meeting between the two schools. BU opened its scoring 7:20 seconds into the first period. Junior forward and assistant captain Bobo Carpenter connected on a pass from senior defenseman and captain Brandon Hickey by way of sophomore defenseman Dante Fabbro and scored on a power play. Almost ten minutes later, the Terriers found the back of the net again. Freshman forward Hank Crone scored off a rebound from freshman forward Ty Amonte and recorded his second goal of the season. Freshman defenseman Cam Crotty also picked up an assist. Junior forward and assistant captain Jordan Greenway and Crotty assisted on Tkachuk’s goal and freshman forward Logan Cockerill recorded a helper on Bowers’ goal. Carpenter added to the lead 5:35 in the middle period off a feed from senior defenseman John MacLeod. Just over 12 minutes later, senior forward Chase Phelps scored his first goal of the season to put BU up 6-0. Sophomore forward Gabriel Chabot and freshman forward Jake Witkowski added assists on Phelps’ goal. With under a minute to play in the second, Tkachuk scored his second goal of the night. On a power play, Tkachuk beat Sun Devils’ sophomore goaltender Joey Daccord to give BU a 7-0 lead. BU scored one more time in the final stanza for an 8-0 shutout victory. Seven minutes into the third, Carpenter chipped in a pass from Chabot and recorded his second hat-trick of the season. 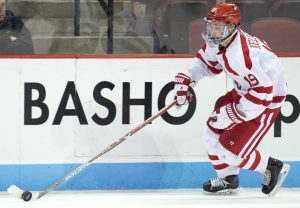 Carpenter is now tied for seventh in the country with 16 goals on the season and sophomore goaltender Jake Oettinger recorded his third shutout of the season. Saturday night, BU once again opened the scoring. Hickey scored a power-play goal just under eight minutes into the first period. Less than four minutes later, Fabbro doubled the Terriers’ lead. Graduate transfer forward Drew Melanson and Tkachuk added the helpers on Fabbro’s goal. Under a minute into the second period, Arizona State scored its first goal of the weekend. With a 5-on-3 advantage, freshman forward Johnny Walker recorded his team leading seventh goal. Sophomores forward Brett Gruber and defenseman Brinson Pasichnuk tallied the assists. The Sun Devils knotted the game at two just over seven minutes into the second period after freshman defenseman Jacob Wilson recorded a short-handed goal. BU regained the lead 19 seconds later as senior defenseman Brien Diffley recorded his first goal of the season on the power play. Senior forward and assistant captain Nikolas Olsson and Fabbro added assists. In the third period, Bowers banged in a rebound from Fabbro by way of Cockerill just over 11 minutes in the third period. The goal was originally ruled a no-goal, but was overturned after review. Arizona State scored once more in the third on a power play. Redshirt senior forward David Norris beat Oettinger with just over five minutes to play. 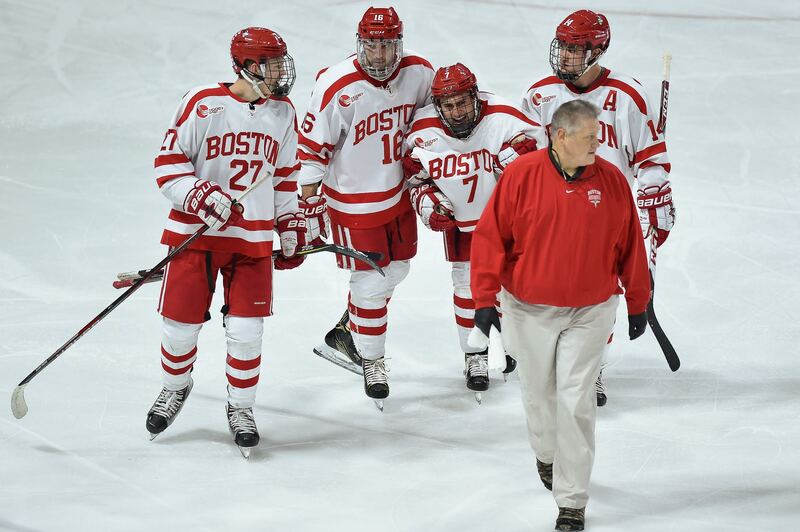 Although, it would not be enough as BU held on and beat the Sun Devils 4-3. The Terriers will resume Hockey East play against the University of Massachusetts Amherst Friday night on the road and will look to extend their win streak to five games. 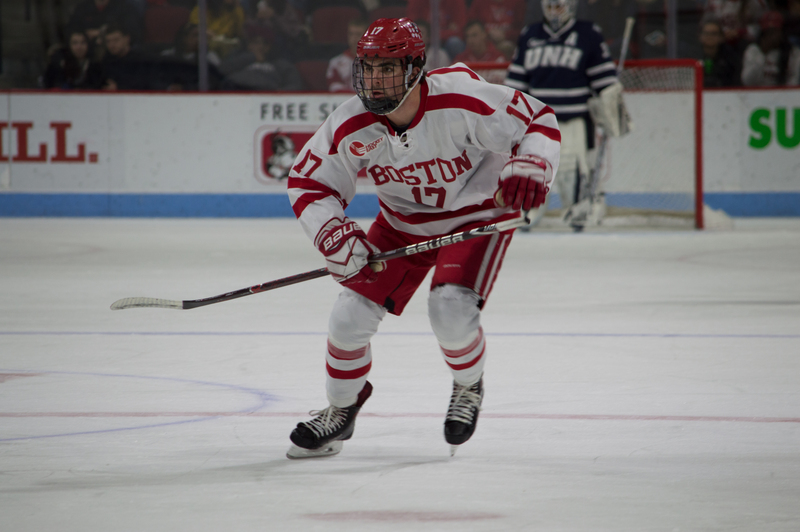 One of Boston University’s go-to forwards will return for the 2017-18 season. Jordan Greenway, amidst speculation that he would turn pro with the Minnesota Wild, has confirmed to The Boston Hockey Blog that he’ll be back for his junior season. 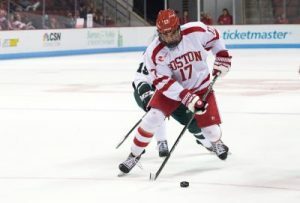 The announcement comes as a boon to Terrier hockey fans, as forwards Jakob Forsbacka Karlsson and Clayton Keller and defenseman Charlie McAvoy have all signed early with NHL teams. With Greenway back, BU now retains three of its top six forwards from the 2016-17 campaign, including rising sophomore Patrick Harper and rising junior Bobo Carpenter. Across his first two seasons at Agganis Arena, the 20-year-old amassed 57 points (15 goals, 42 assists) in 76 games. During his sophomore season, Greenway helped Team USA win a gold medal at the World Junior Championships. Clocking in at 6-foot-5 and 230 pounds, Greenway was drafted in the second round in 2015 by Minnesota.